The Mum2Mum Play n' Change Mat Provides a clean space for baby wherever you are. Bright rugby stripe. Think of this as a picnic blanket for your baby. it's perfect at the park, on the carpet or in the car. Any place you need a spot to clean up baby or just a blanket for play. The super handy Play n' Change Mat gives you a clean space for baby wherever you are. It's the mess- proof, must-have for parents everywhere. 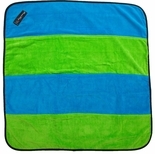 This is a great stroller blanket as it can provide a lot of protection from the elements! Provides a clean space for baby to play or be changed wherever you are.